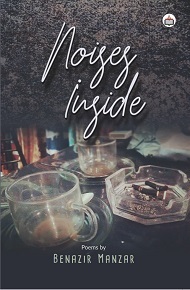 Noises Inside is her first collection of poems that delivers thoughts generated as an outcome to various emotions that one goes through whiletravelling, sitting in a class, seeing someone after long, first failure, struggles of life, desire, friendships, nostalgia, desertion, abandonment and isolation. It brings forth the effect on one’s mind and heart when one suffers within. This collection began as a private book of poems that she created for herself several years ago. Poetry as an unabashed expression of sensuality and self-pity has been a critical common place. This conventional approach, however, has indirectly instigated the urge to re-read the same poems from a different perspective with a faint hope of finding other yet-to-be-explored aspects that may help liberate and give readers newer insights and critical interest. The collection tells about inner conscious, sense of being with oneself, trying to give words to things that could be very casual and general to the rest. It also holds views that are trying to question and bring various aspects to one’s psyche.